Calais Film finished ! Extract on Channel 4 news at 7.45pm tonight! Some imminent screenings for Refugee week see below. Planning big thank your screening for all donors in 2 weeks, then its going to be doing campaign and festival screenings, then another Channel 4 item !!!! So thrilled to get it twice on national news    !!!!!!! Here’s the link to the channel 4 item- so glad we go it out in time to impact the court case! Was a struggle but we did it! Thanks all donors!!! Loads of screenings in London this week . And had four offers of human rights festival screenings already. This is to say that we are in the last two weeks of the film’s edit – and I want to thank you so much for getting it this far. We have locked off picture and are now doing the sound edit , the music, and all the final stages. I have rushed it to the finish line because the first of the big High Court cases is being heard at the end of June and one of the Barrister Chambers in the Inns of Court is to hold a screening with Lord Dubs present, to consider what evidence the film presents in the light of the legal challenges. As soon as that’s done I am hoping TV will buy it or at the very least show extracts, and then when that is resolved, will be able to plan its theatric and campaign life after… So be assured I will commit to get it out there the best I can, in the best ways. On the last two shoots, I met more girls- they are trying every night to get onto the road and are extremely vulnerable. As we know, in the Calais area the police have cracked down very heavily and they are constantly being arrested and held, plus many have encountered danger – one girl Sara, Eritrean, told me that she was hiding in a refrigerated truck (they do this to lower their body temperature to avoid heat-sensor detection) and got to the point where she couldn’t breathe because of the severe cold. Another girl died, aged 17, hit by a truck. Ive also filmed in Calais Nord graveyard where there are rows of graves of refugees who died, many of them lone minors. The graves are marked just with a wooden stick and a number. No name. Whenever it was hard doing this film, that drove me on the extra mile. The thought of kids dying un-named and unknown, so far from home, and so young. The very last kids we filmed were living in the dunes a the back of where the Jungle used to be, so near the sea their tent got wet on the high tides. It was the only place left for them – hemmed in on all sides by CRS, the fenced road, the port and the sea. (Us too- we got stopped and hassled by the CRS in the night when filming there- kids safely hid, we couldn’t! ) They were pointing to UK in the dark and saying, thats our future. Both they and the girls, should have been here under either Dubs or Dublin 3 Regulation. There aren’t enough lawyers to take them all on, but we hope our test cases will win and we hope the film will give power to lawyers and others to take this fight on. The possible rescinding of the Human Rights Act will make such situations commonplace- unnecessary hardship and suffering caused to young victims of war. Ther have been updates on the Calais Children webpage www.calais.gebnet.co.uk. Latest news is we got a small grant from the Bertha Foundation which has helped get us near the end. We remain about £4000 short to cover archive rights, final sound edit and sound mix, and I would like to get a decent phone and/or phone credit, to the 20 or so kids I’ve worked with the most, so that we stay in proper contact in the future. So if you are prepared to pass this on to others to donate I’d be so grateful. ! I thought originally this would be filmed over a week or two in October, and we’ve kept going for 8 months and uniquely seen the whole story through. Now we must wrap to present it to the Government and the courts. Thanks again, do forward the web address www.calais.gebnet.co.uk to your networks and check it for what happens next with the finished film! All my sincerest thanks and best wishes for making this possible ! Thanks for reading and supporting to date! You’ll be pleased to know the end of the film is in sight- we want to release it for Refugee Week (June 19-25th) and before the results if UK High Court cases being brought against the Home Office on Dubs, and Dublin 3 , and I am on it day and night as ever. Also pursuing a shorter  TV version. And continue to be in touch with countless of the young people and supporting them with phones, phone credit, clothes, referral and advice on their cases and just being someone they can call or text at any time when things get tough, which sadly is a lot.. Things have become unbelievably bad for the ex-Calais kids. As you all know, very few were taken by the UK the week after the Jungle came down, then the UK claimed that they were all in ‘appropriate accommodation” in France over the winter (they weren’t ) and brought a small number more. Since then the Home Office have completely redefined the Dubs Amendment twice (in November 2016 and February 2017 ) both times cynically to reduce the number they night have to be responsible for form a respectable and do-able flow to a pathetic trickle – then they tried to vote it out via the Commons altogether. Meanwhile the young people have either left completely- and are living precarious lives with no protection at all, right outside any system- or they have gone back to Calais and facing massive police crackdown and being effectively criminalised. There have been more deaths of refugees- and I found this particularly hard to deal with as I’m sure any of us would, seeing a memorial at Norrent for a young man “beaten to death by traffickers” and in Calais graveyard, a whole row of thirty refugee graves without even names, just marked by numbers. At least nine of these were children and young people. To die without a name, and lie alone in that rainy cold Calais graveyard with no-one to come and mourn your passing or your sorrow, is a n unbearable thing. We have filmed more in the area beyond the old Jungle- which young people we’re working with, have to cross- we hike with them over a strip of scrub and sand dunes, all the way trapped on the wrong side of the border fence, under the faint glare of the security lights and the regularly flashing lights of the CRS and gendarmes. It’s scary for us, but this is what these kids do every night to get to where they sleep. Leaving them and heading back the two miles, we’re inevitably picked up by heavily armed CRS (paid for with your tax dollar, dear UK citizens) and have to scramble out of that situation. also been to film in another refuge a distance away from Calais where girls and boys are surviving, though still sleeping rough at night. When in the name of God did we start we deny children a bed and food, or any kind of medical care “in case it encourages others.” We don’t say this to UK citizens in need. Social services or hospitals  don’t turn away people “in case it encourages others.”  When is it okay that they sleep on the dirt floor or am empty house, wth rat droppings, no heating, no light and no bed and no food? And regularly arrested by police and held for 4 days for no reason? When is it okay they’re trafficked and abused, and live in unstable and threatened communities in the woods, controlled often by people who mistreat them ? Please somebody tell me when that’s ever okay. Do please as ever pass this on if you can bear it and know that the end is in sight. Ive interviewed Lord Dubs now and the key players in the UK. I’m editing all the time, and  working towards commentary, sound edit , sound mix, fact check, grade and all the other delivery elements which sadly cost money. This cost more time and money than I thought but it is beginning of the end phase now and I can never ever thank those of you who have supported the film. Whenever it seems too much or I’m too tired or the situation feels to dangerous, I think of all of you and feel a big responsibility  and also a warmth and support that keeps me on it. ! And we have got some kids to UK- and others in at least some kind of contact network and protection, they know theyre not entirely alone. Plus us seems Macron may re-negotiate the le Touquet agreement that allows us to have out border at Calais, and demand better UK provision for the minors. If you can support me in this very last lap, great. As ever its www.calais.gebnet.co.uk please forward. Also please those of you who funded me, let me know if you DON’T want your name on the credits, I’ll be getting to that stage soon!!! Total so far 8 months – thought it would be a couple of weeks only  couple of weeks! of weeks. But it matters, as this is the real, lived, hard edge physical and visceral suffering caused by ‘policy’ and ‘’pull factor’ and ‘Brexit’ and ‘walls’ and it say something absolutely shameful about a western society- a society that will use children and youths’ health and safety as bargain counters in their nationalistic border game. The kids are cornered as thoroughly as I was when I went to their coastal tents.. What possible options do they now have? Except if we fight for them-  and, oddly, for ourselves. I hope everyone is well and has had a great Easter. 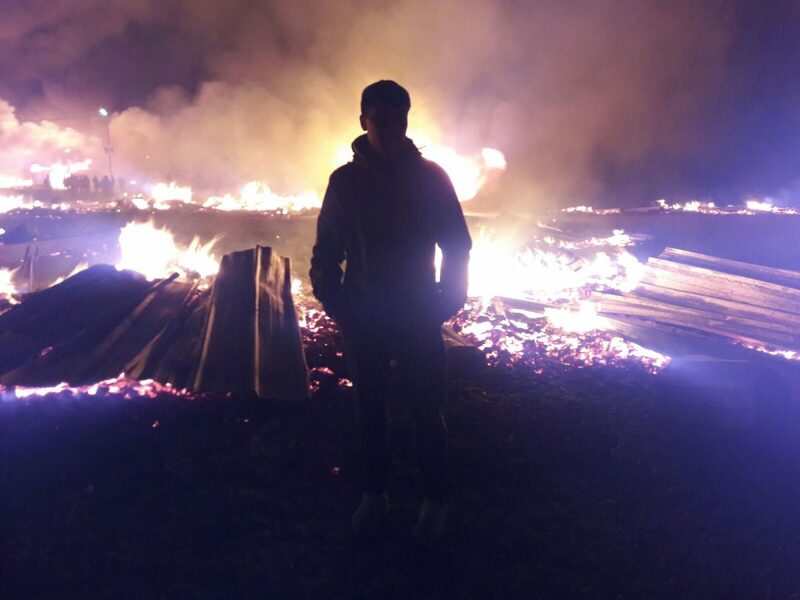 You will probably have seen that the only remaining refugee camp in France was burnt down a few days ago. Some of our kids who were sleeping there during the fire but as far as Ive ascertained so far, they are all physically ok. (See one of them below, he sent me this picture, plus a further press pic below that.) However they’re left with nowhere as Calais is under police lockdown and Dunkerque is no more,and will not be replaced. Like the old Jungle the empty site is being policed.. Its endgame for so many minors, and mentally they are very stressed. So many of them should have qualified under the Dublin 3 Regulation (relatives in UK) or potentially Dubs Amendment. Now they are comletely stuck.They are being tear-gassed even when they sleep. Criminalised. And starved as its much more challenging to provide food and shelter to them, than before. In the light of Dunkerque and messages of desperation Im getting from our contacts there, we’re doing one final humanitarian/filming trip this coming week, taking sleeping bags and clothes, and checking in with the boys who were at Dunkerque and the girls who are at the tiny illegal camp in the woods nearby. At the UK end, Ive been doing final interviews and am seeing Lord Dubs in the next few days. Film is still due to be released in time for Refugee Week June 19-25th, and as evidence to Parliament and for the High Court challenges to to the Home. Office coming up in June. Please do pass this on to any mailing lists you havent yet! Last last gasp to get it done. A quick update on the film for those who are interested. While a few were brought to UK in the winter period, many with a strong Dublin 3 claim (close family in the UK ) were overlooked. Those without family, who ought to have qualified under the Dubs Amendment, were entirely  ignored -the Home Office having drastically (and, we argue, unlawfully) limited the scope of Dubs in November last year, precisely to avoid having to take many children. (There are 85,000 unaccompanied minors in Europe- Dubs would have at least provided safety to 3000 and taken the pressure off other EU states). In Feb 2017 the French gave up on the UK pathetic effort, and closed the centres they’d made available all winter, leaving 1200 kids and young people in limbo (And some, in the mountains  in extreme cold and distress). 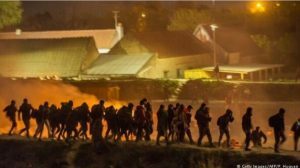 The latest situation is that over 600 of them have made their way back to Calais, as the only place that’s familiar to them.They all feel that promises made to them by the British in the last days of the Jungle were not kept. I have committed to get the film finished by early June, for reasons below. Please do help support us in the last lap-we are busy trying to get over 40 hours of material in 6 other languages translated; buying in key archive footage; editing and sound-editing – as well as keeping in regular touch with up to 50 young people in France and Belgium, getting them phone credit, getting them basics they need to survive,  getting them lawyers where we can. One boy, E, had both his legs broken on the road , and I have been supporting him in hospital in Lille. Others are living in rat-infested woods and squats in Calais, and have been  getting them clothes and sleeping bags- thanks Amir Amirani! !And trying to keep in touch. Plus as ever working with the lawyers. We have to get this abuse of asylum law through the courts and we won’t stop. The address for the film donations is  www.calais.gebnet.co.uk and the Facebook page is Calais Children. All very best and thanks again for making the film, happen. I feel privileged to have been able to stay on it for 6 months, its a story that needed telling in depth It highlights issues much broader-UK after Brexit-human rights law- basic humanitarian principles that should not be lost. J runs a Catholic ‘safe house’- though even it gets raided. He says of the 600 lone children now back in Calais, less than 40 have a bed at night. 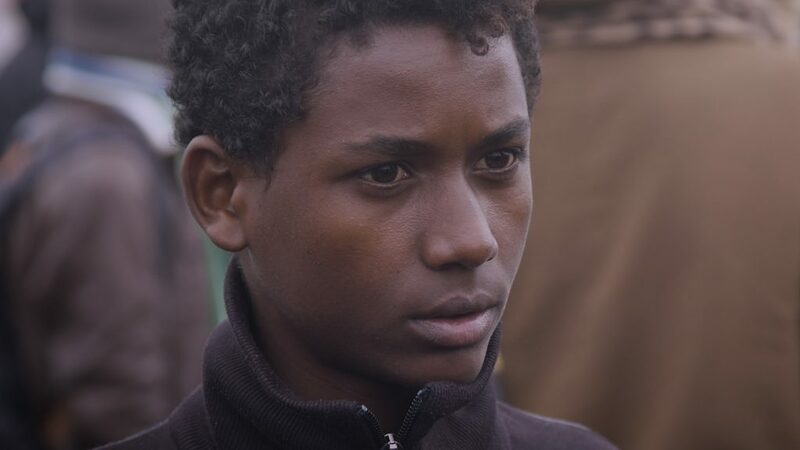 R, 12, Eritrean, who I met in Le Havre, has made it to the safe house. He has an aunt in the UK and should be with her, but like others has been overlooked as a Dublin 3 case. He shivers with fear if he steps outside the house. What future has he now? In March 2017, the Home Secretary Amber Rudd sneaked an announcement into a Parliament focussed on the Brexit debate, announcing the final number of acceptees   the Dubs Amendment. From Dubs’ initial proposal that 3000 minors without family should be brought to the UK  from France, Rudd stepped down to only 200 from Calais- those already taken in Autumn 2016, and no more. There was no recognition of the tortuous process the young people had been put through due to failed UK promises.- incarcerated in  the containers, sent into a winter of exile and starvation to wait for assessments that never happened, excluded from Dubs when the government narrowed its terms to discriminate  by race. Rudd also sought a motion to scrap the Dubs Amendment entirely as ‘the crisis was over.”  Protests were held and a vote in Parliament saved the Amendment, but as long as it is applied by the Home Office in such a vastly limited and cynical way, it is a hollow victory indeed. Meanwhile in Calais  the children have no option but the deadly cat-and-mouse game with police and CRS, while every night making ever more desperate attempts to reach the truck-stops and the port. Y, 16, from Syria  talks about freezer trucks being the best option- police cannot detect body heat thought of course risks are high. Access is now more than ever controlled by traffickers and gangs. JL, Afghan,says they try to leave Calais every night  “but north of the port there are Iraqis with knives, asking us for money. South there are Romanians with guns.” There have been stabbings, and E from Eritrea, with whom I’ve filmed a lot, had both his legs smashed when run over by vehicle – he may not walk again. This film began by my exploring whether the children of Calais have  legal case to be in the UK. My findings were that a great many die, either under the Dublin 3 Regulation because they had family members in the UK, or under Dubs as particularly vulnerable young people alone in Europe. Over 6 months we have seen their Dublin 3 claims ignored and thrown aside, and we have seen a cynical  dismantling of the Dubs Amendment to limit the scope and spirit of what it was designed to protect some of the most vulnerable young people in Europe. In June 2017, both our court case ZS and Others, and two other major challenges go to the High Court to dispute the shoddy outcome that has left children suffering and stranded. A cross-party Parliamentary inquiry is going to be conducted to see what went wrong. Hope everyone is well, and thanks so much again for your continued comments and support! For those who have relatives in UK (Dublin 3)  they feel utterly betrayed as their cases were simply missed. I personally through this work have come across 17  kids in such a situation. Luckily Ive been able to get 2 of them so far on TV  (see below) and Duncam Lewis our legal partner have taken several on pro bono. This week in response to pressure from all of us, th Home Office has agreed to re-open the Dublin 3 cases. So that is a major victory and hope all our 17 will now make it, in addition to the 14 already here directly because of this  Calais Chidlren campaign. (One of these as previously noted here, was found on arrival to be suffering from a  serious heart condition and has since been operated on and recovered, now living happily with foster mum in Hounslow 🙂  And many others, if only they can be found and legally represneted…! (ou see why the work never ends. having rights means nothing if you dont have a topped up phone and a lawyer, sad to say). The rest- those without relatives, who ought to have been considreed under Dubs, are nos stuck in France. The irony is that if we cant get them in under Dubs they may well be better off claing asylum in France at least for now, but  very few are, as their experience of France is up to a year of  Jungle in which they were fired at with rubber bullets and tear gassed by the French on a nightly basis. Notwithstanding that the CRS doing this were directy paid for by the UK, this makes the kids perceive France as a hostie and aggressive place, not somewhere they want to stay. So out of the 1200 that were confirmed as having  been put on the buses out from the Jungle on Nov 2nd, a couple of hundred were finally accepted by the UK but a large fruther number were  lost, as above. Those that remained in the centres have been told by the French authorities that they must apply to stay in France or be made instantly homeless- this has led to a further stream of young people either homeless in remote corners of France, or again heading back to Calais area. I have managed to keep filming all of this through your support:  In Calais, in secret hideouts and safe houses; In Brussels, where some have gne and are sleeping rough; and in the South (Pyrenes Orientales)  where they are soon to be made homeless- and its still heavy snow and been up to minus 12. Also I have been taken on for days as consultant producer for BBC South East (Inside Out) , for  ITV News as before  (see report on 11 Feb) , and last week for Channel 4 News. The daily fee I get for doing this I put into the CALAIS CHILDREN film budget. And its great to be getting the story out nationally too. In due course I’ll put all the links on  the website. Also C4 News has run  some of our  footage-  of the boys In St Denis de Cabanne in a Jon Snow piece 2 weeks ago, and then  last Friday 17th Feb,  a Simon Israel piece on the young people in Perles-et-Castelet- both of whom Ive been following for months now , and shots of others back in Calais. My overall view: there are now confirmed to be 5-600 kids back in Calais and not only are they sleeping rough, they are being hounded by police and CRS. Every time Ive been in Calais Ive been stopped and detained for questioning, and the kdsi arent even safe any moe to walk from A to B. Most shockingly I was told by the police there is now ‘zero tolerance” of refugees and they can in theory “walk about ”  (though even thats not true, they arrest them for up to 4 days and detain them in St Omer) but not “s’installer” that is, have a place to stop or sleep…. when I said, “so they must walk forever then” they said, “yes exactly.” JESUS. Its insanity. There have also been reports in the French press of French citizens being prosecuted for aiding them (Somoene taking 3 Eritrean girls to hosptial was fined 30,000 Euros and suspned jail sentemce last week). Even religious houses offering night shelter are being raided. So filming in Calais has been lke occupied France…  Getting kids quick from pillar to post.,under contsnt atack. One boy I filmed with a lot was hit on the road near Hasbrouk and had both his legs broken. There were fears he may have to have them amputated but luckily now that seems unlikely He is now in hopsital in Lille. I proised to go visit him and take his two close friends  to see him. It became like a covert operation- as I dont frive, couldnt take the boys on the train Calis to lille as armed cops all over the stations. I  had to get a local supporter to drive us very low profile and be wary of police stops, and police  questioning us. Glad to share this with all of you, as Calais feels really lke wartime if yorue working with these kids now. In other news, Help Refugees brought their  challenge to the High Court last week and the full case will be heard in May . Our case (ZS and Others- Dunam Lewis) is linked to theirs,  so ours will be heard we hope soom after theirs. There is a Solidarity  protest sleepover at Parliament  area  tonight  (Speeches from 8, ive been invited to gvei one on this work) and another petition going in  to Downing St tomorrow 9 am . There is a march n Saturday- I’ll send links or it is all on news and social meida. Please do spread the funding link to your finds and colleagues-  Calais re-starting is putting this right beak in the news,  and I want to colete the film to coincide with the May court judgments. But out of  funds again! So far 17 shoots in Frace UK and Brussals trying to keep tabs… last lap. please please help. Hope the above illustrates that we are having real effects on real kids- every day, I promise. The fact we care and go on fighting for them, quite quite literally is stopping some doing further suicide attempts , self harm, and running off . Got to keep in contact and keep the issue alive- its an absolute tragedy that this wasnt sorted in October by Home Office, and several hundred since then have frozen , starved and/or run off,  and three more died, becaus eof it. Shameful. The UK govt  will have to answer for this. We’re winning. Slowly .Dublin 3 kids now have a chance- but Dubs still needs more fighting. Heartened that so many people and so much media has cme out and trashed Amber Rudd and the Home Office for their vicious and cynical announcement to limit Dubs kids into UK. WE have material on Channel 4 News tonight, https://www.channel4.com/…/child-refugee-row-350-children-h… and I’m shooting with ITV news tomorrow, for tomorrow night. URGENT ALERT 5th February 2017: Please donate now! Between 12th and 20th Feb the French will close the Centres where they temporarily housed the Calais kids. Many have already left in panic, and are back in and around Calais where they are living rough, freezing, in the mud and in backstreets, constantly hounded by CRS and poiice. The Home Office have failed to take hundreds of kids who have a legal case to be in the UK. The Duncan Lewis case which Im most closely involved in, went to the UK High Court on Friday, to get an urgent answer on our lead case ZS who has now made 4 suicide attempts and has been in and out of hospital. We got granted a response from the Home Secretary within 4 weeks. By then he will be homeless and may not make it. Our larger case, ZS and Others, brings 37 Children that i was able to identify in the Jungle, and who ought to qualify for Dubs Amendment relief, is stayed behind the second case below, which is being heard next Friday. This second case, brought by Help Refugees which goes to the High Court this coming Friday 17th, begins the process of disputing the lawfulness of the Home Office’s narrowed definition of the Dubs Amendment (restricting it to 2 nationalities and under 12s- totally against the spirit and letter of the amendment.) They are bringing the principle. If they win, we have a strong chance then to bring our 37 actual cases, straight after. Meanwhile I have been filming in Norrent, an unoffical camp where someone has died, Calais where kids are living in filth and squalor, now hunted by cops and in and out of detention, and Brussels where many have gone and are sleeping rough- – also desperate. I am in touch with more and more kids and am struggling to get lawyers to take on more , especially some of the girls and some of the really young kids that Home Office has missed. I have a list of 14 who have relatives in the UK and should have been allowed here under the Dublin 3 Convention. With both Dubs and Dublin 3, bring able to bring a substantive number of cases as we’re doing, means they will hopefully set precedents, for the more to benefit. After 4 and a half months I am getting pretty run down but I am determinednot to stop. But I have now totally run out of funding. have gone into considerable debt to keep filming. I wanted to stop but just hard that Yemane, one of our youngest, is alone in Calais and is living rough, and I need to see him. And m really worried about the girls too. I am still reflecting om the very sad death of Samir, a 15 year old Sudanese boy, last month. It was hard to see, and to film at a respectful distance, the other boys carrying his coffin in minus degrees at Chalon in Eastern France, His mum back in Darfur will never be able visit his grave, and never see him again. That was tragic day. But what bolstered my spirits was, that of the 13 Calais kids we got to UK via Duncan Lewis in early November, I have just been told that one of them, a 12 year old, “H”, lke Samir had a heart condition. But H was given as all children are, a thorough medical check when he was brought to UK and his the condition was identified. He has now had surgery, and thankfully is now in restored health. All donors, you have made this possible. All this is big stuff we’re on the verge of, if we can SUPORT THE LEGAL RIGHTS OF THE REST. A legal right means nothing if you’re starving, cold and being harassed like criminal. It needs us to bring it to peoples’ attention and to the courts. Please please contribute for this vital last lap of the film, and pass it to your friends and contacts to do the same. The court cases go on over next 2-3 months. The film I would like to be completed by May as there is a Parliamentary committee being formed to assess what went wrong over the Calais issue and this will be vital evidence. Hope you’ve had a brilliant Festive season! For regular readers (!) you’ll know that we were able to contribute to identifying and bringing to public attention the  (final total) 1900 lone children and young people who were living in Calais Jungle (Calais is a UK border and you, dear UK taxpayer, paid the French to fire tear gas and rubber bullets at these kids when they lived there) –  and I have been lucky enough to be able to lead a campaign and make a film to demonstrate that the majority of these kids have (and had for up to a year prior) the legal right to be in UK -under EU Dublin 3 Regulation that allows lone under 18s in extreme distress  to move forward though Europe to countries where they have close relatives –  and the rest, a moral and lawyers argue,  a legal right to have their cases heard under the Dubs Amendment (the clause of the last UK Immigration Bill that requires the UK government to offer sanctuary to some of those 85,000 lone refugee children in Europe who are this winter facing freezing cold, starvation, exploitation and trafficking. Many of the Dublin 3 and Dubs unaccompanied minors should have been in the UK a year ago – instead, the UK Government, despite paying the French over £40 million a year to riot-police and wall up Calais, did not go over and simply assess the cases at our (UK border) queue. Some of the children have died since then, including a 14 year old Afghan boy in September  when we were there, who was eligible under Dublin 3. They have all suffered brutally . This to me is a UK, not a French, breach of morality and humanity, just as much as if  they’d died 25 miles closer in Kent…  We’ve offshored our ‘refugee problem’ to France just as the EU has offshored its ‘refugee problem’ to Turkey, Jordan and Lebanon. Denying lone children and vulnerable young people their rights, and paying massive sums to France to contain the problem (the equivalent of £40,000 per migrant in Calais) so that the UK government can keep its figures down and look ” tough on immigration” is to me obscene. In August 2016 the French called the UK’s bluff by saying they’d clear the Jungle and that the British border officials should move the 1000 metres from their Calais posts and sort out the backlog of cases in the Jungle- including the children. But they never came, and more people suffered and died. a. President Hollande finally acknowledged the existence of 1500 young people and forced the UK to do likewise.The UK accepted 2-300 though continued to insist there were no more than`a   that. b. The UK and French agreed that the French should temporarily host the rest around France while UK belatedly processed them. The UK did this in the most summary and cynical way, claiming the normal high ground for bringing a few dozen to UK when in fact nearly a thousand had the immediate right to be here. And then we heard the French were keeping the kids in often barbaric conditions, not the HO-promised “Specialist centres for children” but unstaffed and unsafe empty buildings  with no food or heating. And even better, the below news concerns Duncan Lewis the lawyers we work with-  most of the clients mentioned are kids I found in the Jungle and then persuaded DL to come out and sign  up (pro bono) Plus the wonderful Social Workers Without Borders , also pro bono,  came out to do the best interests assessments. DL is now taking the Home Office to court for their unlawful treatment of these children. THIS ONLY HAPPENED BECAUSE OF YOU GUYS CROWDFUNDING AND ENABLING ME AND THE TEAM TO GO AND DO THIS WORK. Neither I nor Duncan Lewis would have been there if it hadn’t been for your support. So thanks again and congrats to us so far!! Around 20 of our kids- including little Daniel- the 9 year old- have got to UK and are safe and warm this Xmas. These others represent a legal challenge to the HO’s negligence- their neglect, then unlawful dismissal, of their cases. I have visited as have colleagues, many of the ‘centres’ where the French have placed the children who could be in UK and whom the Home Office has not yet taken. Some places there is no food at all, others only dry bread. Many are still wearing the thin t shirts and plastic flip flops they had from the Jungle, in minus temperatures. Many are starving and many have run away. At least two have  tried repeatedly to commit suicide. Whether you have very very kindly contributed already, or whether you are unable or unwilling to commit funding, do please very kindly consider forwarding this to your friends and contacts and via social media with a note from you. I need to keep filming to complete the 50-minute film, which will I hope be out by March-  but even more importantly to keep in touch with all the young people who call me every day, who first contacted me in the Jungle and who are now in dire straits. Funding goes equally to buy them coats and shoes etc and food when we go see them, as well as continue the investigation and the campaign to secure their rights. We have raised £26,000 so far, and need around £12,000 to keep going to the end of the legal challenges and hopefully a successful outcome. This film will have ongoing impact for all the other refugees and stateless people who have rights but have absolutely no way of bringing them to actuation- without language help, legal help, advice and public channels and awareness, ‘having rights ‘ means nothing at all. That’s the brutal reality of human rights, as I’ve learned in the last four months. Please please spread the word and help us keep going. Please all of you, spend 10 minutes spreading this to work and social contact lists or any other organisations you know of. Thanks a million! We’ve made so much progress. Lets keep going to the end. Children left with ‘nowhere to go’ after Calais ‘Jungle’ camp … – ITV.com 27 Oct 2016 – Read Children left with ‘nowhere to go’ after Calais ‘Jungle’ camp clearance latest on ITV News. Calais ‘Jungle’ camp clearance operation declared over – ITV News 26 Oct 2016 – Read Calais ‘Jungle’ camp clearance operation declared over latest on ITV News. Migrants heading to Paris as Calais ‘Jungle’ clears – ITV News – ITV.com 28 Oct 2016 – Read Migrants heading to Paris as Calais ‘Jungle’ clears latest on ITV News. Dear all, sorry for the long silence, this doesnt mean nothing happening, rather the opposite- havent rested since last post!! Second, the conditions under which children are being kept in France are highly variable. Almost all are being looked after by volunteers not the “specialist staff” that Home Secretary Amber Rudd promised on the record. Some of these are doing a good job but in other places conditions are dire and there are on-record reports of children having been physically abused by the ‘carers.” They have in these places been fed noting but bread and the daily allowance to keep them is 5 Euros. Many are still in the same clothes they were, when they left the Jungle- sandals and t shirts.This is a freezing winter- in eg Luchon where many Sudanese boys are, its up to minus 12. With support from your generous crowd funding I have been able to go to eight centres all over France- as far as Pyrenees, Atlantic coast, all Eastern and S Eastern France, and continue to visit others. As well as filming I’m takng aid and stuff, backed by Social Workers Without Borders who accompanied DL solictors on their Calais mission. The Home Office says it has now finished taking those who have a real case but I have on this trip (In France now, hence hasty writing as ever! ) discovered very many that still have a legal case. And that many of the ‘full and comprehensive interviews” of vulnerable and in some cases torutred chdilren, lasted 5 minutes or less and did not have any child experts, legal experts, social workers or even interpreters present. They were then told of the negative decisions 2nd hand, casually by domestic staff at the centres- Oh youre not going anywhere. This is in breach of their EU and UN rghts . I have met sveral who have attempted suicide. I am today at the funeral of another who has died of heart failure. Its not the physical condtions that bother them ( though they bother me) its that large numbers still have a legal case to be in UK under either Dubs or Dublin 3, and have had a travesty of a ‘hearing’ with no chance of a fair decision. UK thinks out of sight out of mind. BUT THEYRE NOT OUT OF OUR SIGHT !!!! Many others have run away in despair. Some are sleeping rough back in Calais and in Belgium. Many French centres are due to close at the end of January and NO ONE HAS COME UP WITH A PLAN FOR THE KIDS WHO HAVE FOLLOWED EVERY INSTRUCTION AND YET WILL SOON BE HOMELES AGAIN. There will almost certainly be more tragedies- deaths from cold , suicides, if we dont keep on this and report it and use al this evdence in the upcoming legal chalenge.